A charming bed and breakfast. A diabolical murder. A guest with a secret to hide… The prestigious Lavender Bed and Breakfast in Chiddlinghurst, England has stylish decor, lovely gardens… and a deadly problem. Norah Travis, a beautiful young woman, has been found murdered in one of their rooms. Detective Inspector Graham, a crusader for justice with a penchant for tea, and a dark side of his own, is assigned to the case. Joining Sergeant Harris at the sprawling estate, the duo set their caps to solving the vicious crime. But with no witnesses and no motive, their investigation is quickly mired in a web of lies and deceit. The jocular proprietors, Amelia and Cliff, seem to have nothing to hide, but the same cannot be said for their long time guest, Tim. Then there’s the bitter ex-husband, the tight-lipped housekeeper, a doddering old man… There’s no shortage of suspects, but Graham’s instincts lead him to investigate Norah’s mysterious past. And a heinous secret soon comes to light… A secret that just might be worth killing for. 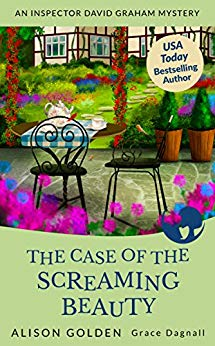 The Case of the Screaming Beauty is a traditional mystery with a modern twist. Fans of Sherlock Holmes, Agatha Christie, and CSI will want to share a sip of tea with Detective Inspector Graham, and dive into this quintessentially British mystery series today.